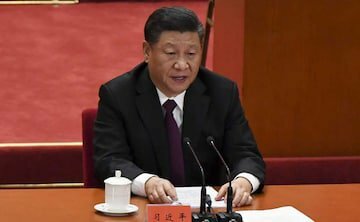 China’s President Xi Jinping has said that China will not give up the use of military force as an option to ensure the reunification of Taiwan, while insisting the island would ultimately be reunified with the mainland. Xi further said, Beijing reserves the option of taking all necessary measures against outside forces that interfere with peaceful reunification. One day ahead of Mr Xi’s speech, Taiwan’s president Tsai Ing-wen said, Beijing should respect the insistence of 23 million people on freedom and democracy and accept the existence of Taiwan and use peaceful means to resolve its differences . Taiwan is a self-governed democracy and for all practical purposes has acted as an independent nation since 1950, when China’s nationalist government was defeated by communist forces . China, however considers the island to be a renegade province, not a country in its own right.